The Ultimate Guide to Pork Chops – How to Cook Pork Chops, How to Freeze Pork Chops, How to Thaw Pork Chops, Where Pork Chops Come From on the Pig, and How to Fit Pork in Your Family’s budget – plus tons of tips to get the most flavorful, juicy, and never-dry pork chops – ever! Pork chops are an iconic comfort food dish – quick, easy, hearty, rustic – they are filling and packed with protein, less expensive and fatty than beef, and are relatively easy to prepare. But as anyone who loves pork chops knows, pork chops can get tough and dry pretty quickly. 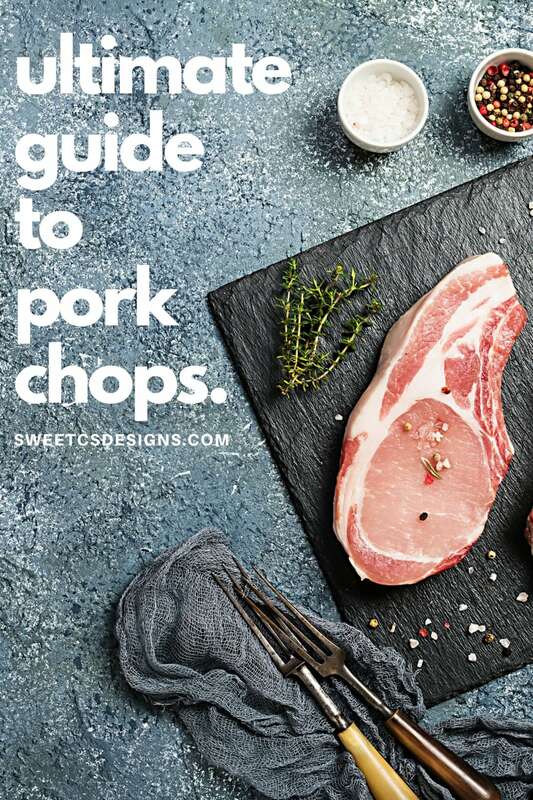 This guide to pork chops has everything you ever wanted to know about the other white meat – with tons of tips to get the best pork you’ve ever eaten! This guide will help you find the right kind of pork chops for your recipes, how to cook pork chops perfectly, how to save money on pork chops, how to freeze and thaw pork chops – as well as some of my favorite pork chop recipes! Pork chops, like other meat chops, are a loin cut taken perpendicularly to the spine of the pig and usually containing a rib or part of a vertebra. Pork chops are not processed, and are leaner, than other cuts of pork with a lighter flavor – making pork chops a healthy and delicious staple for so many families. First off, it’s important to know what part of the pig the pork chop comes from. Pork chops all come from the loin of the pig – which runs from the hip to the shoulder, and contains the small strip of meat called the tenderloin. Most of the chops you see in the butcher case are from the ribs and the loin – as they are generally the most popular picks in America – but that can also drive up their price since they are so popular. As you go down from the shoulder to the back of the pig, there are four main sections pork chops come from: the shoulder or blade chops, rib chops, loin chops, and lastly, the sirloin chops. Simple, delicious, and easy baked pork chops are the perfect simple dinner solution for a busy weeknight – and are budget and diet friendly. Pork is one of America’s most consumed meats – and can get expensive quickly – but with a bit of planning, pork chop dinners are perfect for a tight family budget. Using my simple tips below, you can go from an average price of $6-7 dollars a pound for pork chops to about $1.90 per pound, making this easy baked garlic pork chop recipe a budget friendly pork chop dinner. I love buying the big flats of pork chops at my grocery store in the bulk meat section – which brings the price for pork chops to under $2.00 per pound instead of about $6 per pound. Bone in pork chops cook a bit differently than boneless (be sure to check my guide for different types of pork chops below) – but opting for bone-in chops can dramatically reduce your price per pound. Be sure to cook your pork chops according to the cut – again, using my tips below. Butcher your own pork chops. With a little know-how, you can buy large pork loins and cut smaller chops and take advantage of bulk pricing, slashing your cost per pound. And if you’re really ready to make these baked pork chops even easier – try using Instacart to have your groceries delivered! I have been using it for a few weeks and might never, ever leave my house again – it is fabulous and makes putting an easy, delicious dinner like these baked pork chops on the table even easier! You can get a special signup bonus with my code here. If you’re using my tips above to buy pork chops in bulk to save a ton of money, its incredibly important to be sure you keep the pork perfectly tender and juicy if you have extra pork you won’t use right away. Pork can respond poorly to freezing when not done properly – but these tricks will help you freeze and thaw pork perfectly so you can have delicious, tender pork chops that won’t toughen from the freezer! Moisture in the freezer mean one thing – ice! 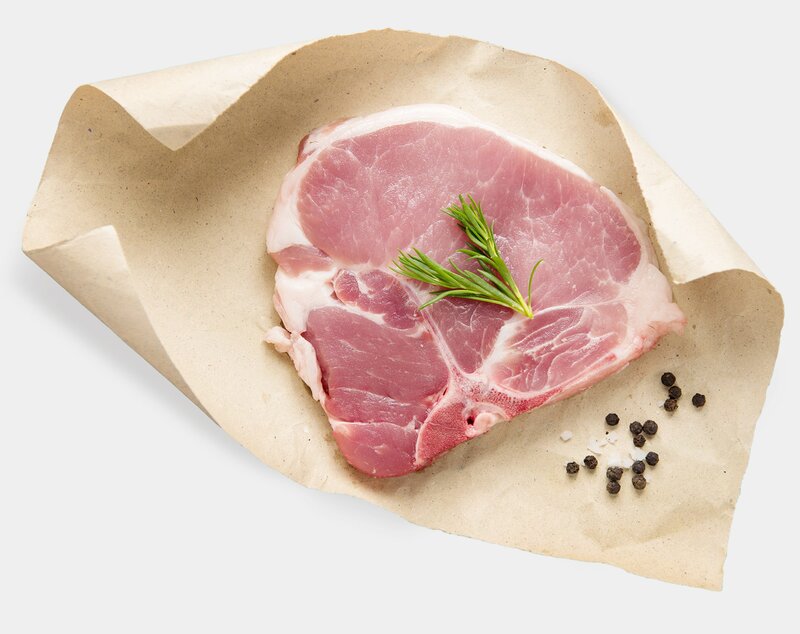 Ice crystals can change the texture in pork chops and make them tough and dry – patting pork chops with a paper towel to remove any extra moisture from the grocery store’s packaging is the best way to prevent freezer burn. If you don’t have a vacuum pack, put the chops in a plastic bag and try to push out any extra air before closing the zip-top. To make freezing and thawing more even and to reduce the chance for freezer burn, keep pork chops from touching when freezing. Even wax paper separating the chops helps so you can easily remove them from the freezer to thaw evenly. 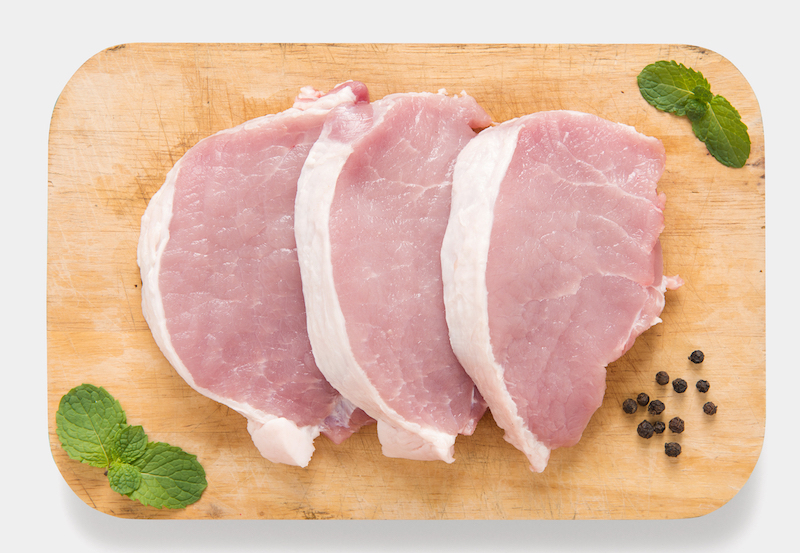 Thawing frozen pork chops in cold water can be as quick as microwaving – without risking uneven heating and tough meat thanks to microwaving. 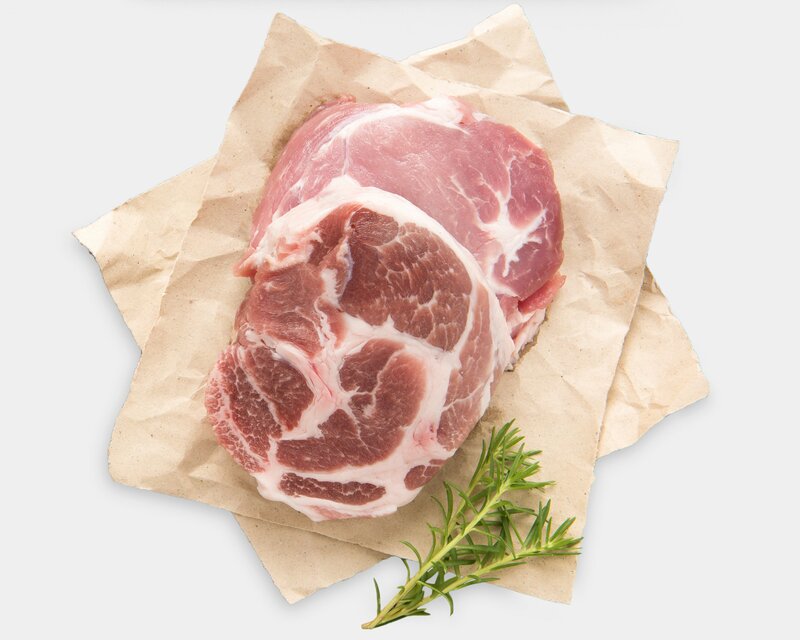 Tightly wrap pork chops in plastic wrap or a plastic bag (be sure to remove excess air bubbles) and fully submerge in cold water in a sink, large pot, or bowl. Do not have raw pork touch the water, make sure it is sealed in something water and air tight. Refresh cold water every 20-30 minutes. If pork chops were not individually frozen (and are stuck together now), it will take longer to thaw. When the pork is thawed enough to pull them apart, do it so they can thaw more quickly individually. Let your frozen pork chops fully thaw on their own in the refrigerator – resist any and all temptation to speed up the thawing process by using a microwave! If you want to know how to cook pork chops and not dry them out, you need these tips for never dry pork chops! Baked pork chops have a reputation for being tough and dry – but they don’t need to be. With a few tips and tricks you can be sure to have perfect juicy and tender baked pork chops every time – and a huge part of that comes from knowing which type of pork chop you have and the best way to cook it! As a general rule of thumb for pork chops – you want to cook them hot, and fast. 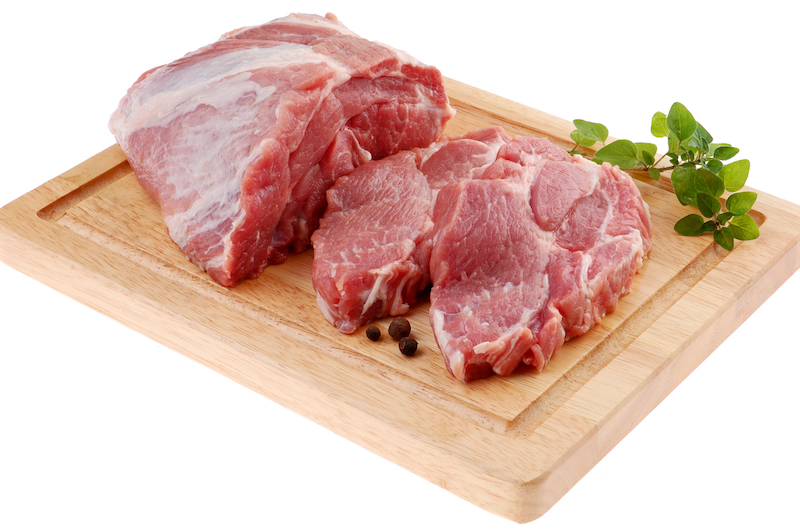 Pork meat gets tough quickly if you cook it too long, or in some cases if you don’t cook it long enough. Boneless pork chops dry out if they aren’t cooked rapidly over high heat – but pork steaks are tough if they aren’t cooked over low heat for a long time. While this sounds confusing, with a quick idea of what type of pork chop you’re cooking, you will be ready to make delicious, super flavorful pork chops that are never dry or tough every single time! The number one tool you will need for any type of pork is a quick meat thermometer so you don’t overcook pork. Overcooked pork is the #1 reason people complain about the flavor or texture of pork since going over 150 degrees can dry pork out in an instant. 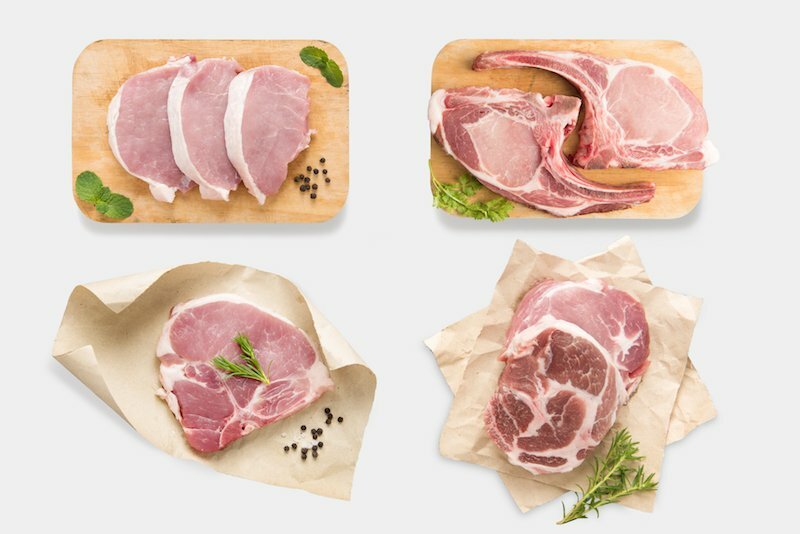 Did you know there are numerous types of pork chops you can buy – and each tastes different and responds differently to cooking methods? Pork is often intimidating because each type of pork chop sounds and sometimes looks familiar – and pork chops are often labeled simply “pork chop” at a store – without the exact cut of pork identified. This can be incredibly confusing and lead to tough, dry, or bland pork – so knowing where your pork chop is from on the pig, and the best methods for cooking different types of pork chops (and why) is critical to perfectly delicious, never-dry pork chops. Often called “America’s Cut” or “loin filets”. Boneless loin chops are both the most popular cut of pork and the trickiest chop to cook perfectly since they have little fat and no bones to help lock in moisture and flavor of the chop – so having the perfect method down is essential for delicious, juicy, and tender pork flavor. Boneless chops taste best when marinating before cooking since they have no bones and little fat or connective tissue for moisture and flavor. Marinating helps to keep the juices locked into the boneless pork chops. Usually toward the head of the loin above the loin chops, boneless pork chops are basically top loin or rib chops with the bones removed. Boneless chops are the most commonly used pork chops in quick and easy one pot pork recipes – they are trimmed, often thinner cut pork chops that are commonly presented in a grocer’s bulk pork flat section. Boneless chops can often be more expensive since they are so popular and require more butchering to remove the bones and fat. 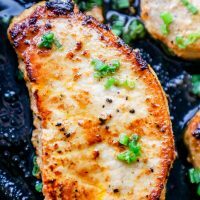 Other delicious boneless pork chop recipes that get rave reviews – one pot lemon garlic pork chops with asparagus, one pot Tuscan pork chops. Center loin chop, center-cut loin chop, loin pork chop, pork loin end chop, porterhouse, top-loin chop. 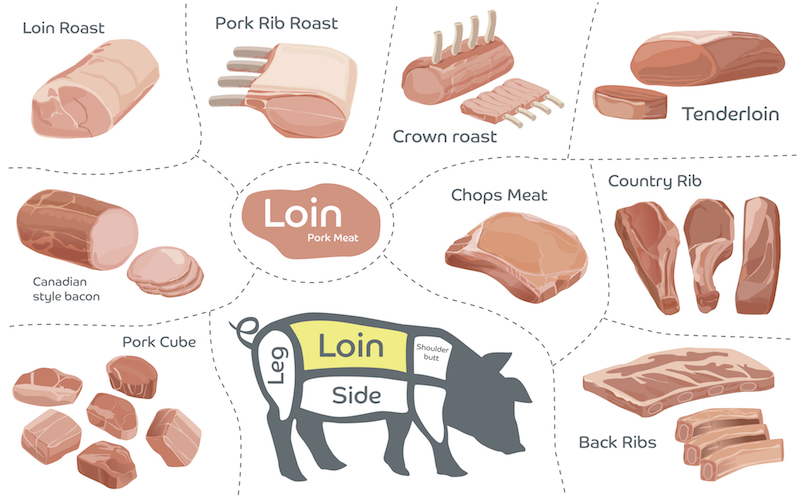 Top cut loin chops won’t have the “T” appearance since they are further from the bone – but center cut loin chops will often look like a “T” thanks to the bone shape. Pork chops with a very visible t-bone will often cost a little more. “T-bone” Loin chops are a little harder to cook perfectly since you have both the loin and the tenderloin present – which both cook a bit differently and at different speed. Use a fast meat thermometer to monitor your pork chops doneness on each side as you cook to be sure you’re not overcooking, which will result in tough and dry chops. T-bone chops need to be cooked quickly – high heat roasted, fried, seared, grilled, or broiled and not overcooked. Often called center-cut rib chop, pork chop end cut, pork rib cut chop, rib end cut, or rib pork chop. Rib chops are tender and have a light flavor – and also have a little more fat than pork loin, so they are a tiny bit more forgiving to temperature, though they can also dry out if cooked too long. Rib chops should be cooked quickly – high heat roasted, fried, seared, grilled, or broiled and not overcooked. 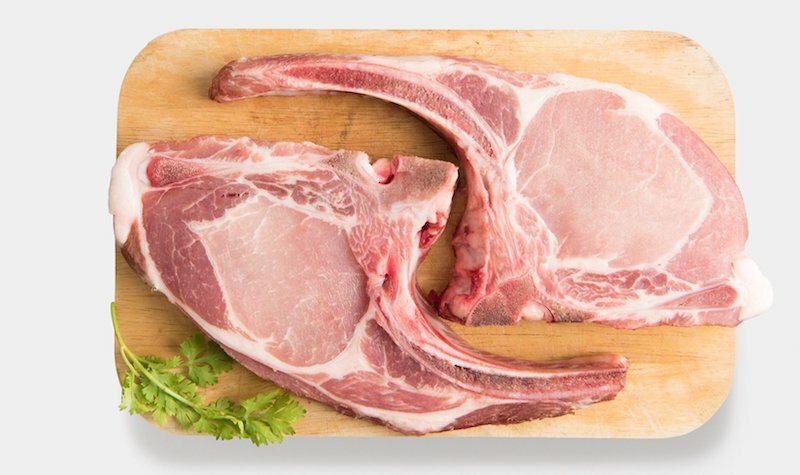 Shoulder chops are also called blade chops, blade steaks, blade-end pork loin chops, pork loin blade chops, pork shoulder steaks, pork shoulder blade steaks, pork steaks. Shoulder chops are darker, have more fat and tissue, and sometimes parts of the blade bone – and are sometimes a bit tougher to find at stores. Shoulder chops respond best to slow braising to break down connective tissue and fat – and are not good for high-heat, fast cooking like this Baked Pork Chop recipe and are best when braised or barbecued. Shoulder chops have tons of rich, meaty flavor – but they absolutely must be cooked slowly to let the gristle cook down and the meat pull away from the bone. Find my Ranch Diced Pork Lettuce Wraps using diced shoulder chops here. Pork steaks are a bit harder to find at the grocery store on a regular basis as they aren’t quite as popular or as flavorful as the boneless chop or the thick bone-in loin chop – but they are very budget friendly. 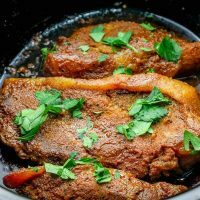 Pork steaks are good in a slow cooker, and great at longer lower temperatures to break down the fat and connective tissue. For an amazingly delicious Slow Cooker Pork Steak Recipe, please click here! 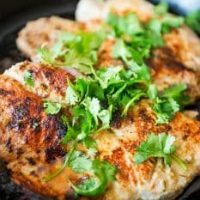 the best pork chop recipes - easy and delicious never dry pork chop recipes that are all bursting with flavor! 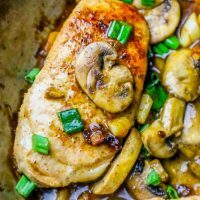 Easy One Pot Garlic Butter Pork Chops and Mushrooms Recipe - easy one pot garlic butter pork chops and mushrooms - a complete rich and hearty pork chop dinner in less than 20 minutes in just one pan! 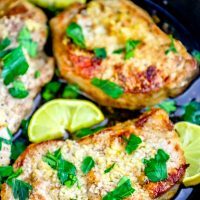 The Best Baked Garlic Pork Chops Recipe Ever is the best oven baked pork chop recipe ever - perfect rich, tender, juicy garlic baked pork chops that are incredibly easy and restaurant quality. With tons of tips for juicy baked pork chops, how to bake pork without drying it out, and how long to bake pork chops for perfectly tender pork! 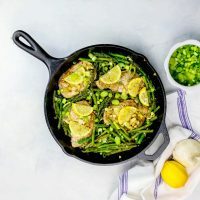 One Pot Lemon Garlic Pork Chops and Asparagus Skillet is a delicious, hearty, and easy meal in just one pan! Tons of garlic pork and lemon flavor, with the asparagus side dish cooked right in the pan with the low carb pork! This quick and easy Grecian Pork Chops Recipe is a delicious, fast way to prepare perfect pork your family will love! The pork marinates a few hours to overnight for a rich, developed flavor and moist and tender meat. 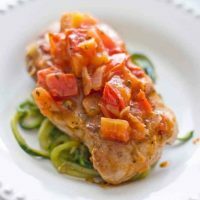 Easy Tuscan Pork Chops that are incredibly delicious and low carb! 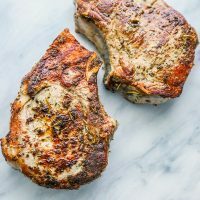 This easy method for Herbs de Provence Pork Chops is delicious and quick - using the best method to get perfect, juicy pork chops every time! 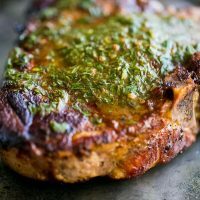 Easy Pork Chops with a Carrot top chimichurri sauce! 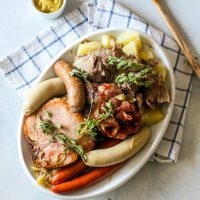 Braised Pork MEat Pot - Alsace Chocroute Garnie from the famous dish in France.